Oh, who's that? 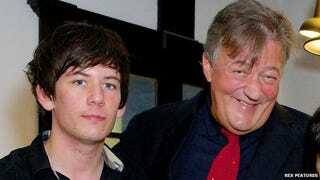 Just Stephen Fry's fiance. Ugh. I feel bad, but is it okay to find May-December romances creepy? Maybe in this case it's particularly because Fry's fame is based on his persona as an armchair intellectual, and it's hard to picture how much he has in common with a 27 year old who is described in one hard-hitting press report as a "self-professed comedian who is also believed to dabble in writing." Which I think is a polite way of saying unemployed. I know, I know — if they're happy then they're happy. But this still gave me a big cringe. ETA I do want to add, quickly, that given that Fry was on the verge of suicide a couple of years ago, the fact that he's entering into a long-term relationship is, of course, a huge sign of optimism and hope for the future on his part and I think that's wonderful. Ultimately they are two adults and are completely free to live their lives. Most of this is just about me feeling guilty for linemouthing.